Over the next few weeks, millions of Americans will flock to a wide variety of Fall festivals. Many of these festivals will have something to do with Halloween, Oktoberfest, and a huge array of pumpkin related events and contests. Attempts will be made to break the world record in a number of categories. (For the record, the largest pumpkin ever grown is 2009 pounds. It was grown by Ron Wallace, from Greene, Rhode Island. Ron brought his 2009 pound pumpkin to the Topsfield Fair in Topsfield, MA on September 28, 2012.) And then, at last, it will culminate in Halloween. Halloween or Hallowe'en (a contraction of “All Hallows' Evening”), also known as All Hallows' Eve, is a yearly celebration observed in a number of countries on October 31, the eve of the Western Christian feast of All Hallows (or All Saints). ~ But if you ask the kids, it’s about costumes and candy! For us, we have the Feast of Tishri that we’ll be celebrating on our next Stated Meeting night (October 8th). As the children of Israel were led through the wilderness, God decreed the celebration of a seven-day feast in the Jewish month of Tishri. He also decreed that this feast was to be celebrated annually to forever remind the Israelites that He had rescued them from Egypt. It should be a good night and I hope to see many of you there. And, of course, this year Grand Lodge is happening the first weekend of October and the following weekend (the 12th) will be a reception for our new Grand Master put on by the Santa Clara Valley Masonic Officers’ Association and held in our Scottish Rite Building. There’s probably no one who’s been in Masonry for any amount of time that isn’t familiar with Right Worshipful John L. Cooper III, Past Grand Secretary and current Deputy Grand Master. MW John is well known as a Masonic Scholar. If you haven’t obtained tickets, please check with the Master of your Lodge. Our Scottish Rite Reunion begins this month as well. We’ll be conferring the 4th Degree on October 29th. Please show the candidates that they have your support by showing up for the conferrals. If you plan to attend the dinner at 6:30 PM, please remember to RSVP. In closing, I'd like to share with you this story. 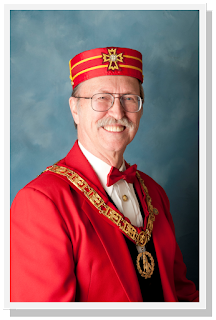 A departed brother, Worshipful Don Locke, Past Master of Willow Glen Fraternity Lodge No. 399, once told me that he was handed a slip of paper by a candidate on the night he was to be initiated. It said simply, "Freemasonry is kindness in the home, honesty in business, courtesy in society, fairness in work, piety and concern for the unfortunate, resistance toward evil, help for the weak, forgiveness for the penitent, love for one other and above all, reverence and love for God. Freemasonry is many things, but most of all, Freemasonry is a way of life." May this be the path from which we never stray.